Biofiction, defined as literature that names its protagonist after an actual historical figure, first became popular in the 1930s, but over the last forty years it has become a dominant literary form. Prominent writers such as J.M. Coetzee, Joyce Carol Oates, Russell Banks, Julia Alvarez, Peter Carey, Hilary Mantel, Colm Tóibín, Anne Enright, Colum McCann, and Michael Cunningham have authored spectacular biographical novels which have won some of the world’s most prestigious awards for fiction. However, in spite of the prominence of these authors, works, and awards, there has been considerable confusion about the nature of biofiction. 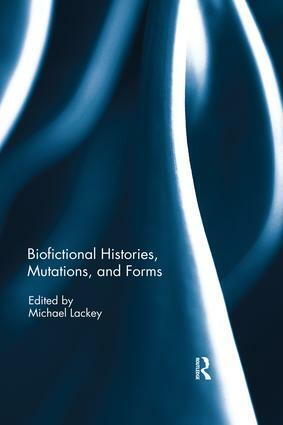 This collection of process pieces and academic essays from authors and scholars of biofiction defines the nature of the aesthetic form, clarifies why it has come into being, specifies what it is uniquely capable of signifying, illustrates how it pictures the historical and critiques the political, and suggests potential directions for future studies. This book was originally published as a special issue of a/b: Auto/Biography Studies. Michael Lackey is Professor of English at the University of Minnesota – Morris, USA. He is a scholar of twentieth and twenty-first century intellectual, political, and literary history. He has authored and edited seven books, including The American Biographical Novel (2016); Biographical Fiction: A Reader (2016); and Truthful Fictions (2014), which contains his interviews with biographical novelists such as Joyce Carol Oates, Russell Banks, Michael Cunningham, and Julia Alvarez.